Steel cut oatmeal is a staple breakfast item in my house, and I find even the leftovers a tasty snack later in the day. But cooked kasha leftovers (aka buckwheat groats), I had no experience with and wasn’t as thrilled about eating cold from the fridge, even with maple syrup. So I searched online, unsuccessfully, for a muffin or healthy cake recipe to utilize the extra cooked kasha I had sitting around after my family had their fill for breakfast. Every recipe I came across called for buckwheat flour, which I also love, but with several extra cups of cooked kasha in my stove pot was of no use to me. I figured adding the soft, cooked whole grain to a batter would yield more nutrition due to less processing, and would provide an interesting texture. Worth a shot, so I went about creating my own recipe. I’m happy to say it was a great success, and one I’ve already duplicated three times since creating it two weeks ago. There is very little maple syrup called for, but my daughter and I find it plenty sweet (my husband thinks it’s good too but even better with honey on top). 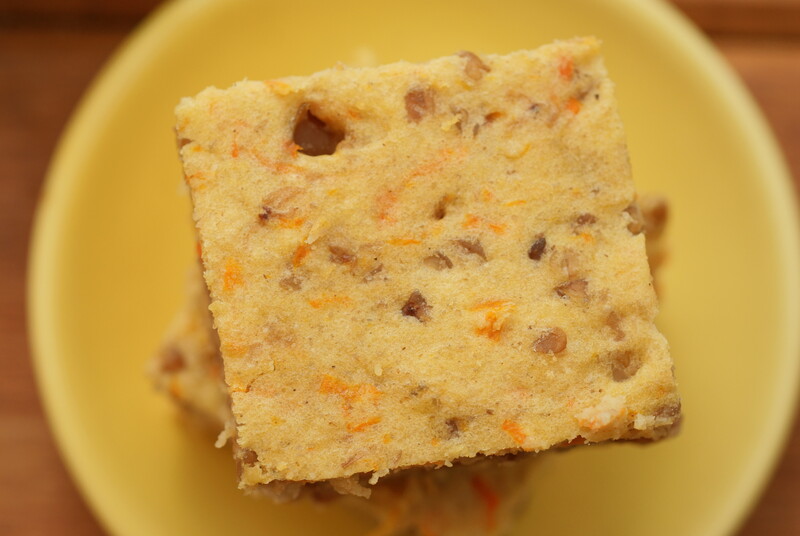 It is deliciously moist and holds together well for breakfast on the go, which has become a huge priority since Ella began attending a twice a week preschool co-op. She’s used to taking a solid hour enjoying breakfast, and second breakfasts, and morning tea…it’s like feeding a hobbit…and I need to speed up the morning routine without taking the joy out of eating. Baking her a breakfast “cake” makes her feel like she’s waking up to a special treat, which she is…it just happens to be a healthy one. Buckwheat groats are eaten regularly in western China and eastern Europe (I found a bag packaged in Poland in my local grocery store’s international section). 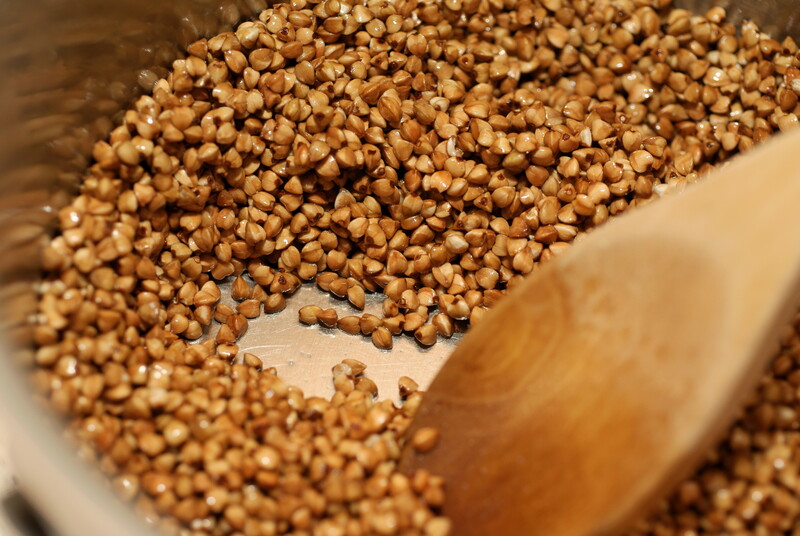 Rich in complex carbohydrates, fiber, protein and magnesium, buckwheat is a very healthy alternative to wheat, and an excellent food for young babies due to an extremely low risk of allergic reaction. –For gluten tolerant individuals you can use white whole wheat flour or whole wheat pastry flour in place of the oat and sorghum (1 ¼ cup total), and omit the xanthan gum. Preheat oven to 350°. Butter 8×8” pan with 1 t. butter. 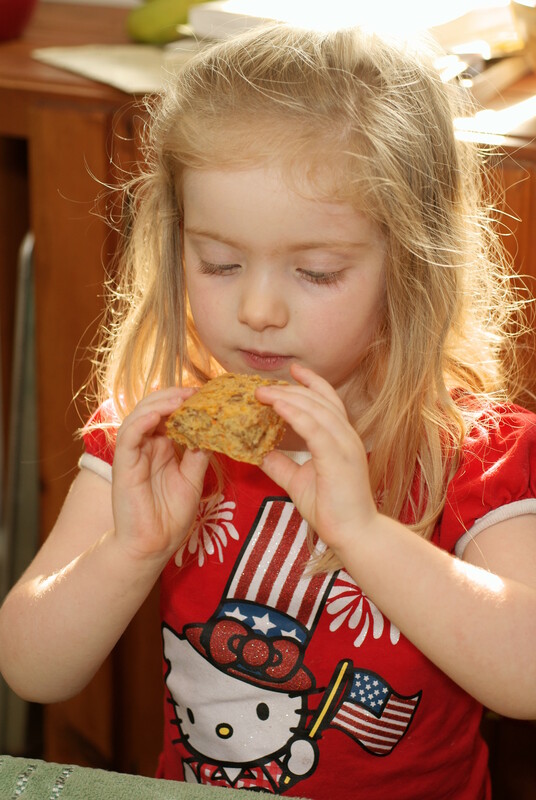 Combine oat flour, sorghum flour, xanthan gum, baking powder and salt in medium bowl and whisk. Add cooked kasha, tossing in the flour mixture. Combine maple syrup, melted butter, milk and egg in large measuring glass or small bowl; add to dry ingredients and mix well. 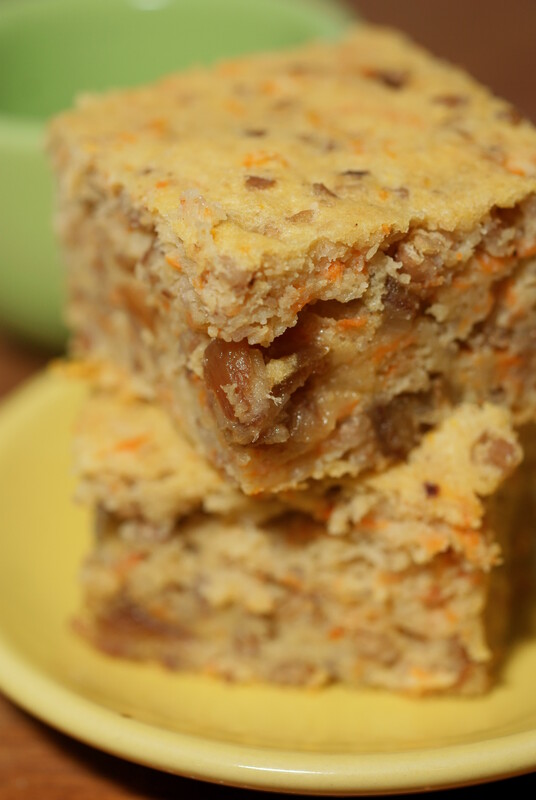 Stir in chopped dates and shredded carrots. Pour cake into prepared pan, smoothing the top with a spatula. Bake 25-30 minutes, until cake is set and a toothpick tests clean. Allow to cool before slicing. Bring water to a boil in a tea kettle or pan. Heat butter in a medium saucepan with lid. Add kasha and sauté until coated. 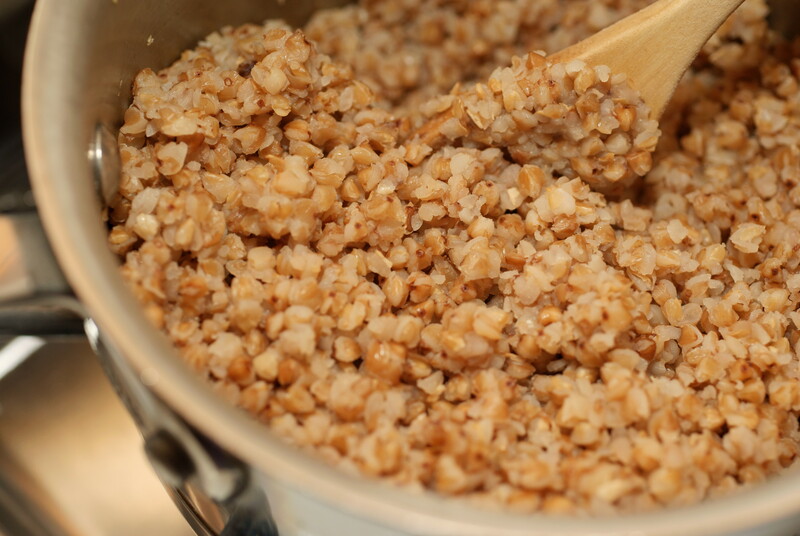 Add boiling water and salt to kasha, cover, reduce heat to low and let simmer 20 minutes until buckwheat is tender. Makes approximately 3 cups cooked kasha – plenty for a morning meal and creative baking. 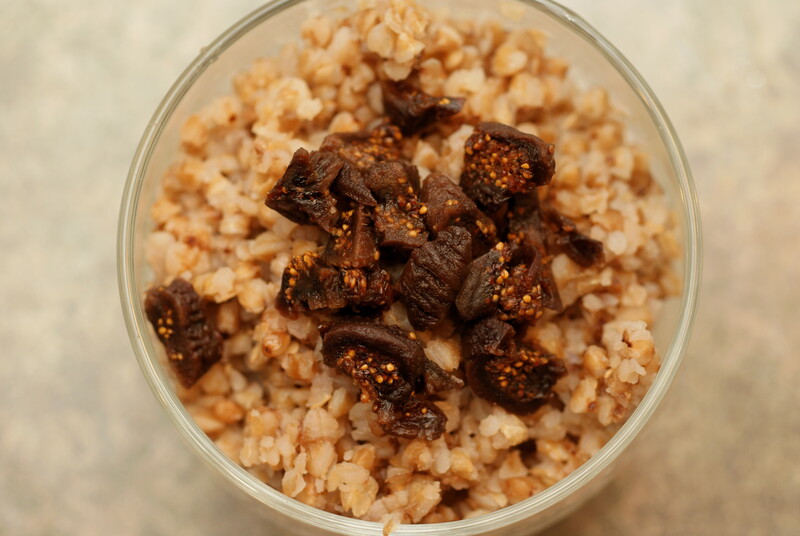 For morning porridge I like adding cinnamon, raisins or dried figs, flax, milk and a little maple syrup. Did you know that your pineapple cores don’t have to go to waste? The core is too tough and fibrous to be enjoyable eaten raw, but after freezing, it makes a great addition to smoothies, tastes a little more muted than the rest of the pineapple, and is scrumptious paired with coconut milk. 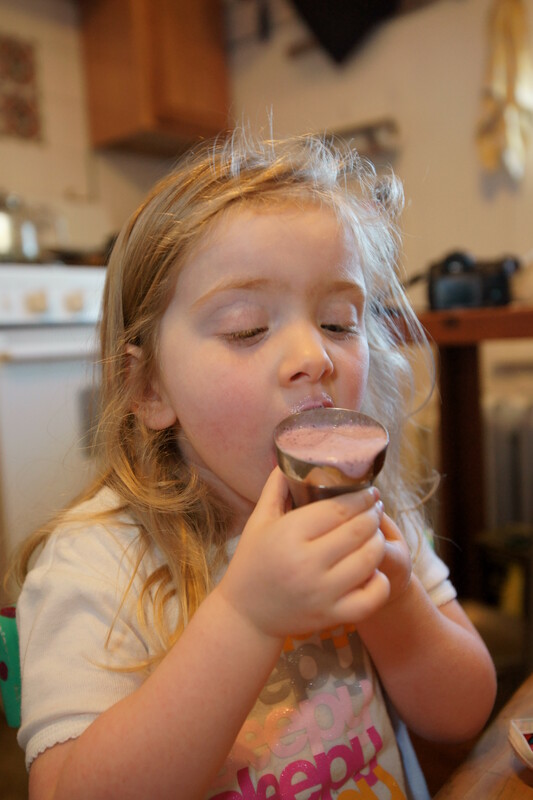 Ella loves her smoothies thick and served in the cap of our cocktail shaker because it’s in the shape of an ice cream cone. 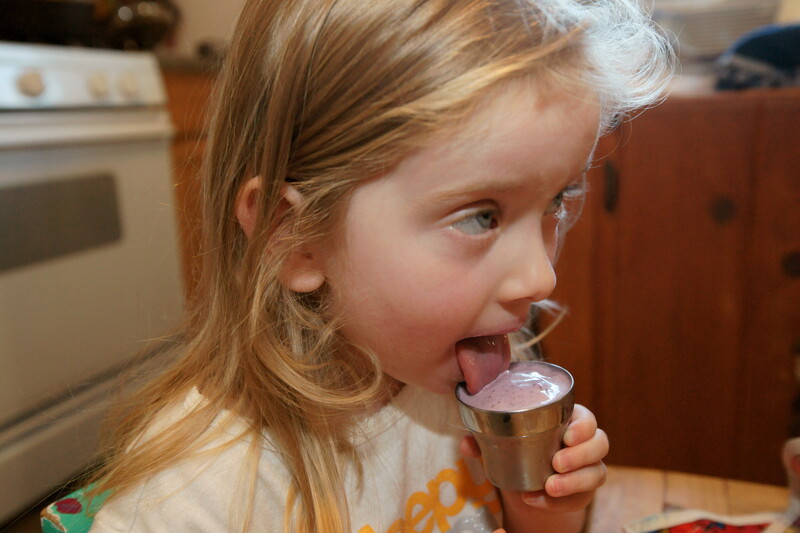 She, naturally, calls it smoothie ice cream and will ask for 5 or 6 refills in the metal “cone”. A little creativity really helps make healthy food fun for toddlers! Place all items in blender and process until smooth. I had a very thick smoothie using 3/4 cup milk and 1 cup coconut milk, but that’s how my daughter likes it so she can pretend it’s ice cream. Add a little more milk if you prefer it thinner. Surprisingly, there aren’t too many things I’ve missed since giving up gluten six months ago, with biscuits and scones being the two main exceptions. 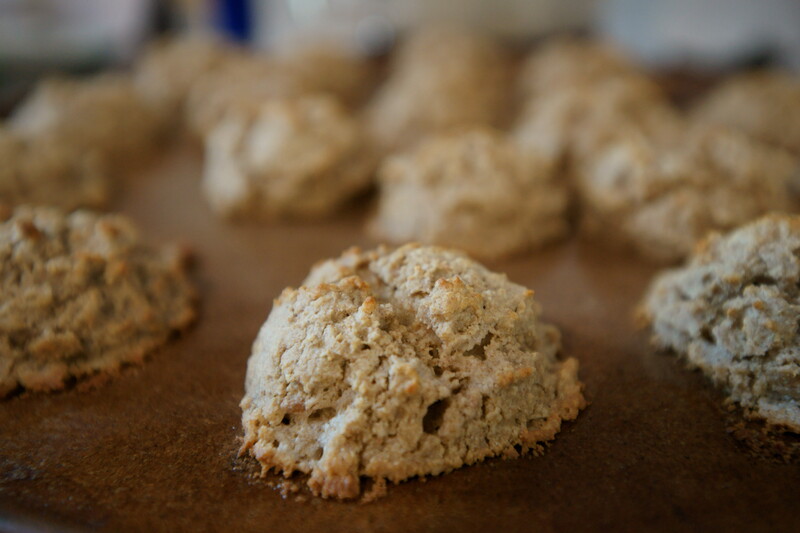 With some modifications I could probably turn these into scones fairly easily, but the following two recipes definitely fall into the biscuit category, and they’re so tasty I’ve been making a new batch every time we run out. It has become one of my bread substitutes because I don’t care for most GF breads available in grocery stores due to the high starch content. In case you’re not familiar with gluten-free breads, most call for large amounts of tapioca/rice/corn starch, which are nearly void of nutrition (potato starch seems to be the exception as it still contains many vitamins and minerals). True, some starch is typically required in gluten-free baking if you’re hoping to see a resemblance to wheat goods, but by changing our expectations, and the expectations of our taste-buds through more adventurous eating, we can easily incorporate a great number of gluten-free flours that are packed with nutrition and flavor. Teff flour is a prime example, with large amounts of manganese, copper, phosphorus, magnesium and iron, in addition to many B vitamins (nutritional bar graphs are available at traditional-foods.com), it’s a grain worth incorporating in your diet. Whisk all dry ingredients in large bowl. Cut in cold butter with hands or pastry cutter until butter pieces are no larger than pea size. Add cold milk and stir with spatula. Portion with cookie scoop, or large spoon, and place on ungreased baking stone or baking sheet; bake until lightly golden brown, 10-13 minutes. I’ve made a biscuit fan out of my daughter this week for sure. Yesterday she ate five Teff Amaranth Biscuits after dinner, lifted her shirt to make her belly talk to me and said “Mmmm I’m full and happy”. Amaranth flour is very high in protein, iron and fiber, and contributes a unique earthy malt flavor that I really like paired with other less dominating flours, such as oat. A drizzle of honey makes these pretty darn addictive. Mix pumpkin, maple syrup, cinnamon and ginger together in medium bowl (1/2 t. maple syrup is enough for me because pumpkin and mascarpone are both naturally sweet, but if you prefer it a little sweeter adjust to taste). Add mascarpone and blend briefly until fully incorporated. Serve with sliced apples. 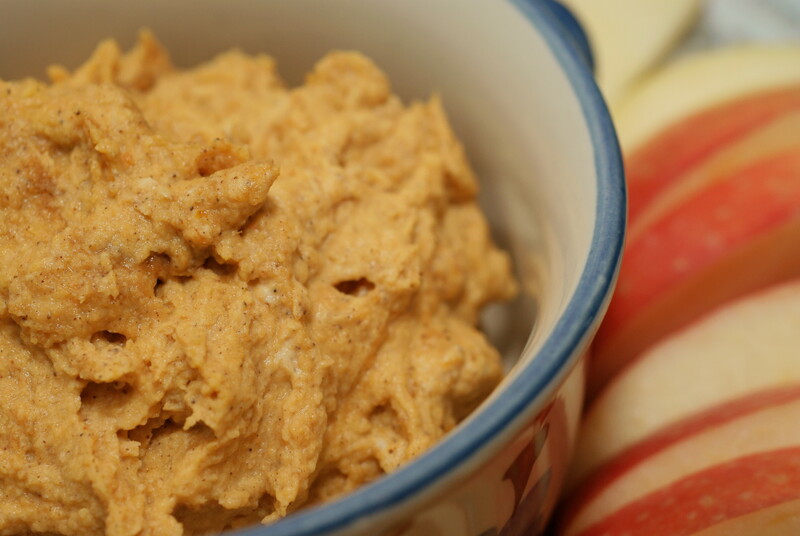 Looking for another way to use extra pumpkin puree? 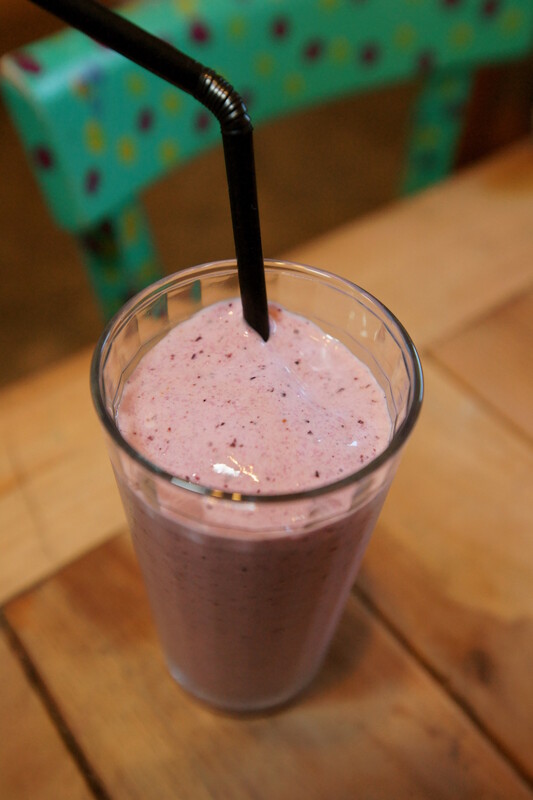 Check out my Peachy Pumpkin Smoothie recipe! 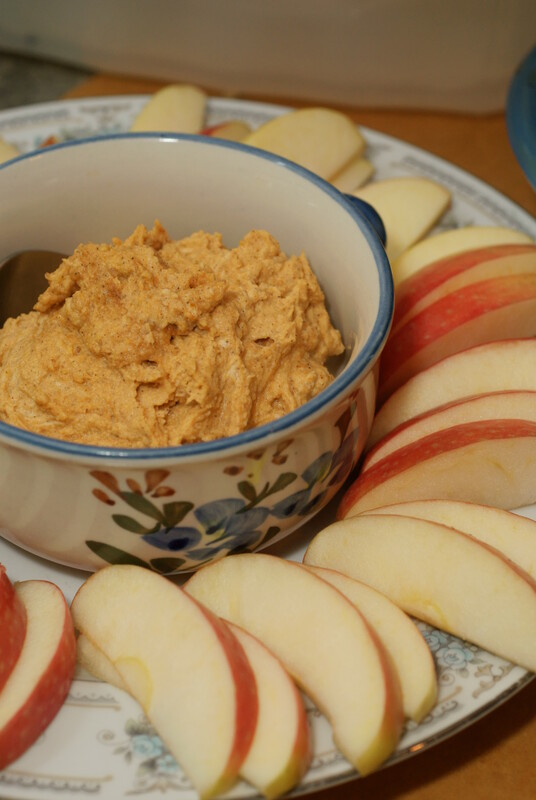 Here’s a kid approved super easy health snack I created this week. 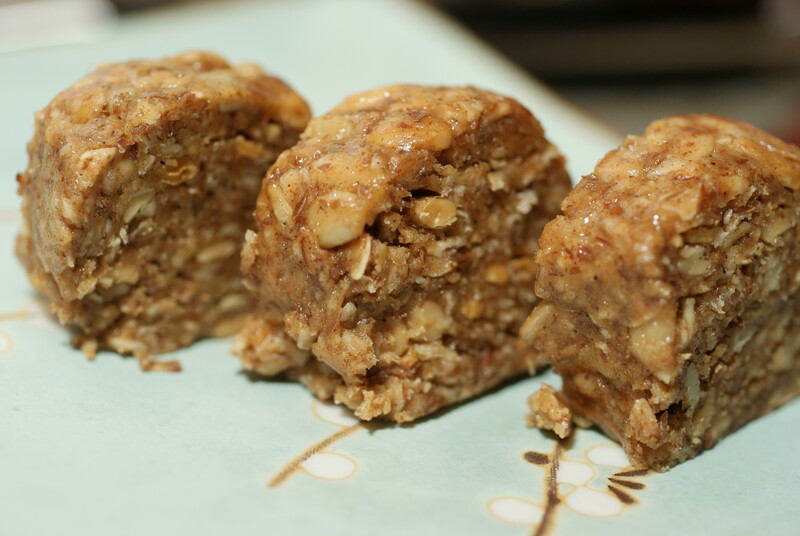 I love making nut-butter snacks because they’re easily transportable, filling, and relatively mess free. It’s also great to see my two year old daughter excited about eating nuts and seeds which contain so many important nutrients. Both flax and sunflower seeds are a good source of protein, calcium, iron and fiber. Also great with a banana for breakfast on the run! Combine all ingredients in medium sized bowl and mix well. Pour out batter onto plastic wrap, form log about 12” long, wrap all sides and freeze for 30 minutes. Remove from freezer and slice into ½” pieces, or to desired size. Store in refrigerator. Preheat oven to 350°. Lightly oil muffin tin or line with baking cups (I made 9 large muffins and 12 mini muffins). In a large bowl, whisk together all dry ingredients (flour – flax meal), then add applesauce, yogurt, and vanilla and mix well. Fold in chopped rhubarb. Batter will seem stiff compared to a typical muffin batter – it’s okay, don’t add additional liquid. Fill muffin tins at least ¾ full (muffins don’t rise much) and bake at 350° 18 minutes for mini muffins / 25-28 minutes for large muffins. Cool on wire rack. 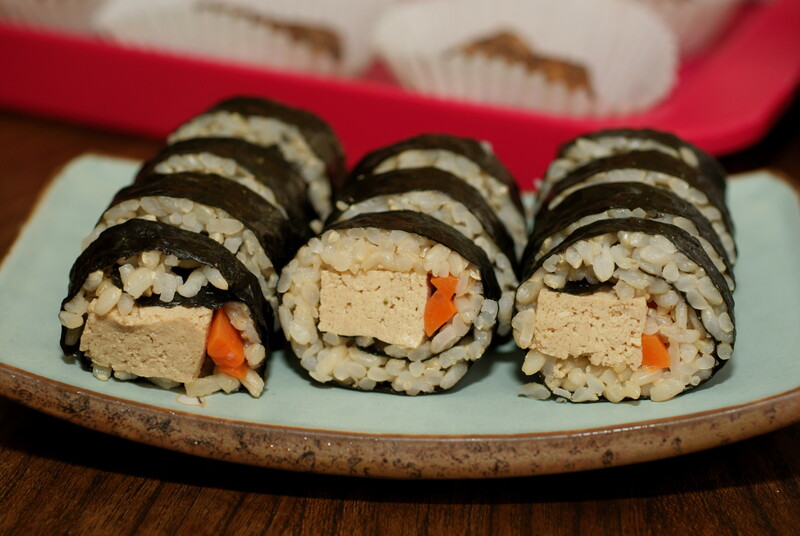 I could eat sushi every day of my life…but since I can’t afford sushi bars or exposing my body to so much mercury on a regular basis, I’m getting creative making sushi rolls at home. 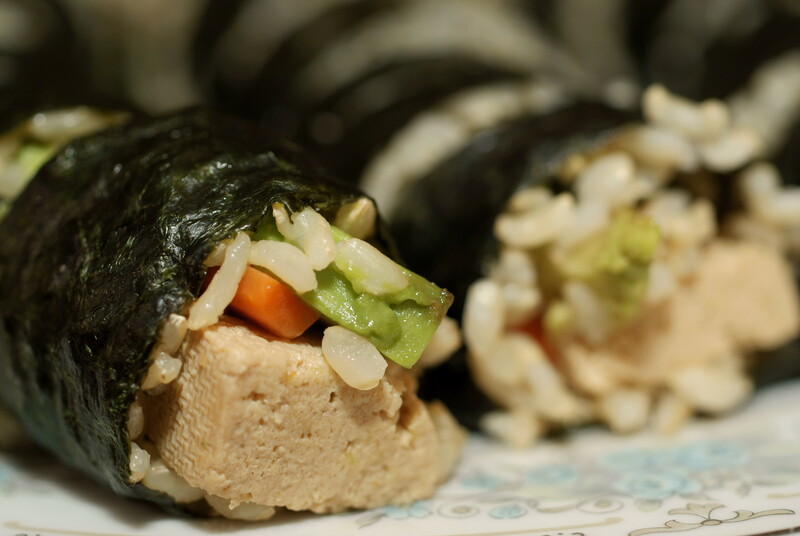 This tofu teriyaki roll is perfect for snacks, play dates, and picnics because it doesn’t require dipping in additional soy sauce – the tofu is already marinated so the roll is adequately salty on its own. A helpful hint for feeding sushi to toddlers: don’t slice the rolls, just leave it whole or cut the roll in half and give it to them burrito style. It’s hard to fit a full piece of sushi in a young child’s mouth, and we all know biting it in half just results in the other half spilling on our laps or the floor, but giving them a full roll allows them to bite off only as much as they can chew. Happier bellies, cleaner floors. Gently squeeze the thawed tofu over a sink to remove excess moisture and cut into large, long strips, suitable for sushi making. In a saucepan, combine the stock, tamari, sugar and sesame oil. Bring to a boil, add the tofu, and cook 5-6 minutes over low heat. Turn off the heat and let sit for 30 minutes or overnight in the refrigerator.